American Resources Corporation’s roots date back to 2006 when the founding partners successfully restructured a coal mining complex of 7 mines and a wash plant located in Floyd County, Kentucky. Since then, management has utilized their operating philosophy focused on safety, efficiency, cost, and coal quality to acquire and restructure high-cost mining complexes in eastern Kentucky to become efficient and profitable operations. In 2015, the company’s wholly-owned subsidiary, Quest Energy Inc., was formed as management actively pursued acquiring strategic coal operations that were struggling during the coal industry’s downturn. 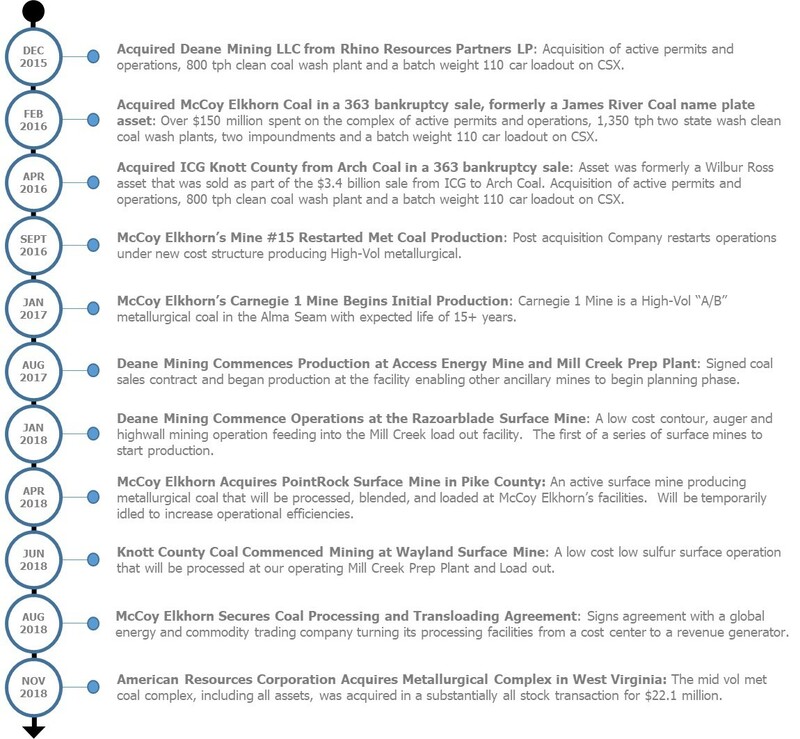 "With over 12 years of experience in successfully operating coal assets throughout all stages of market cycles, we have built a platform focused on our customers, investors and employees to deliver accretive growth safely and efficiently"
Through the acquisition of Deane Mining, ICG Knott County (later renamed Knott County Coal), and McCoy Elkhorn Coal, American Resources currently operates both metallurgical and high-grade thermal coal mines in eastern Kentucky. With a large number of low-holding cost permits that access metallurgical coal, PCI and high BTU low sulfur coal the Company is executing on its organic growth plan while continuing to identify accretive acquisition targets that meets American Resources’ low-cost, efficient coal mining model. American Resources has been executing on a business model of efficiency and growth since its inception.